Walking with Jesus: Day 148: Luke 23:1-25 & Psalm 144 - Why Are Some People So Threatened by Jesus? Day 148: Luke 23:1-25 & Psalm 144 - Why Are Some People So Threatened by Jesus? Why Are Some People So Threatened by Jesus? It's always been amazing to me to see what a polarizing person Jesus was during His time on earth. It seems people either loved Him or plotted to kill Him. Of course, that's not really true: Herod and Pontius Pilate seemed disinterested in Jesus. They didn't want to put Him to death but they also didn't want to follow Him. I guess the real question that has puzzled me over the years is this: Why were some people so threatened by Jesus that they wanted Him to die? As I've thought about it, I've realized that people are just as threatened by Jesus today. In fact, it's often the same kind of people who are threatened by Jesus: religious people, especially powerful religious leaders. Of course, people today don't openly oppose and challenge Jesus; they are more subtle and nuanced. Instead of seeking to crucify Jesus, they seek to redefine Him, to co-ops Him for their agenda. They say "Away with this man!" just as passionately as people did 2,000 years ago, only they say it with the forked tongue of a snake instead of the demanding shouts of a crowd. 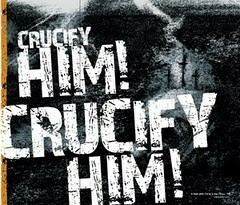 So, why are people so threatened by Jesus that they seek to crucify Him or re-define Him away? I think it's as simple and as despicable as this: Religious leaders are often peddling false gospels, either false ways to gain access to God or false promises of blessing from God. So, when Jesus was here on earth and He openly challenged the false religious leaders of His day, they killed Him. Today, they distort, manipulate or ignore His word to make Him the spokesperson for their false religion. Here's one sobering fact, especially for those of us who fit the description of "religious leader": It's almost always the religious leaders who do the most violence to Jesus. And the number one reason Scripture gives for religious leaders doing violence to Jesus is loving the praise of men more than approval from God. This is a sober reality for any preacher who ever hesitated to speak the truth because of who it might offend or who "played to the crowd" a little too much in a sermon: The approval and acclaim of people is the same road that led religious leaders to crucify Jesus. Am I over-reacting? Am I being overly dramatic? I don't think so. Two of the most blasphemous book titles I can remember from recent history are selling right now, written by professing Christians and aimed at largely Christian audiences: The Power of 'I Am' by Joe Osteen and In Trump We Trust by Ann Coulter. Osteen replaces the power of God and the name of God with the power of our words. Coulter replaces God with Donald Trump. Attention-getting titles? Yes, but also straight blasphemy, marketed by Christians for Christians. People are still busy doing away with Jesus in the name of religion, including the religion of politics. May the Lord have mercy on us and keep us from betraying our Lord for self-motivated gain! like a good soldier of Christ Jesus. you subdue peoples under me. You ride out to battle on a white horse! and you ride out as a conqueror bent on conquest. in the right hand and in the left. mere mortals that you think of us? our days are like a fleeting shadow. while we were still sinners, you died for us.